7th match of 2015 ICC Worldcup has been played between Afghanistan and Bangladesh at Manuka Oval, Canberra today. Bangladesh with all round performances won the match by huge margins of 105 runs. 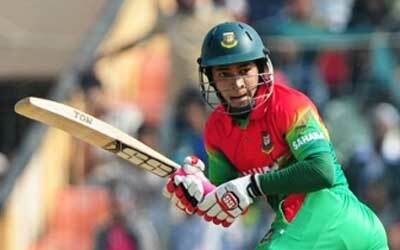 Bangladesh skipper Mushfiqur Rahim declared man of the match for his 71 runs of 56 balls. Earlier, Bangladesh won the toss and decided to bat first. Bangladesh top orders got good start but could not excellarate their innings for long. Middle order bastmen Shakib Al Hasan and skipper Mushfiqur Rahim played good cricket in later overs and anchore Bangladesh inning as well. Mushfiqur Rahim made very well 71 runs of 56 runs followed by Shakib Al Hasan 63 runs. Bangladesh managed to put good totals of 267 runs at the end of 50 overs. Following totals of 268 runs, Afghanistan could not made batter start and lost top 3 wickets just in 3 runs in 3 overs. Samiullah Shenwari 42 runs and Skipper Mohammad Nabi 44 runs tried their best but could not saved the match and lost by huge margins of 105 runs. Team Afghanistan all out scoring 162 runs in 42.5 overs. Mushfiqur Rahim (Bangladesh) declared man of the match for his superb inning of 71 runs of just 56 balls.